Instructors: Ds June Tan, Ps Grace Tan, Ms Vivien Chen. 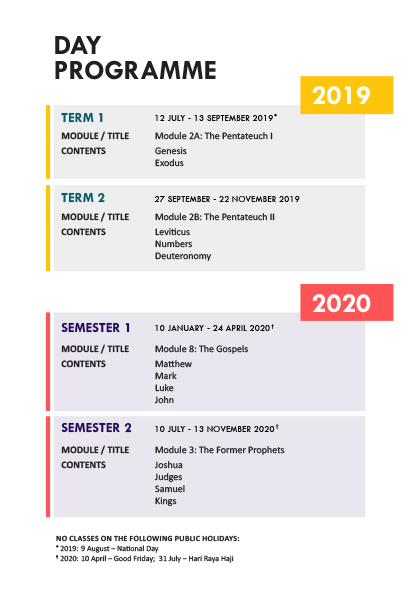 This Biblical Studies Programme enables participants to systematically study, book by book, all 66 books of the Bible. Instruction is aimed at bringing Bible literacy to the participants, to help them know the contents of the Bible and to apply God’s Word to life. Each module comprises an average of 18 lessons for OT studies and 15 lessons for NT studies. Classes are conducted on Fridays, 12.30pm - 2.00pm (1 hour of instruction & an optional 30 min of group discussion). There are no classes in June and December. Participants may choose their modules in any order. The book studies will continue into 2021. (1) Certificate of Participation - This requires a minimum of 70% attendance of classes. (2) Certificate of Biblical Studies (individual modules) - This will be issued on passing a written examination conducted after each module. (3) Certificate of Biblical Studies (Completion of 10 modules) - This will be issued on passing ten written examinations. $5 for written examination (examinations are in November). Payment in cash is payable by the 1st lesson of each module.